More new stacks coming online at VIG this month. Dip in cargo volumes reflect tactical decision at Port of Virginia. Cargo volumes at Richmond Marine Terminal were up 46 percent. 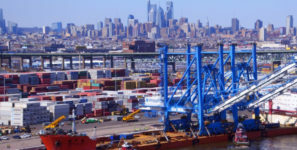 The Port of Virginia is managing the flow of empty containers as part of a larger move to drive cargo throughput during expansion at its two primary container terminals, Virginia International Gateway (VIG) and Norfolk International Terminals (NIT). May’s dip in cargo volumes reflect the tactical decision. The port processed 236,893 TEUs, which is a decline of four percent, or 9,979 fewer units when compared with last May. Cargo volumes at Richmond Marine Terminal (RMT) and Virginia Inland Port (VIP) and were up 46 percent and two percent, respectively; barge volume was up three percent and rail was up two percent. “Our May volumes dipped when compared with last year, but the drop was somewhat by design as we are asking our customers to limit the movement of empty containers to ensure that our effort during expansion is focused on loaded export and import boxes,” said John F. Reinhart, CEO and executive director of the Virginia Port Authority (VPA). “Another factor is that last April, when the alliances went into service, there was an influx of volume moving across Virginia on the big ships that were taking advantage of our deep water and making first-in and last-out calls here. Now, as expected, the alliances have spread-out that volume across the East Coast. The port’s fiscal-year (July 1, 2017 – June 30, 2018) volumes continue to track ahead of last year: total TEUs are up three percent; VIP volume is up 3.6 percent; RMT, up nearly 20 percent; total barge traffic up 5.2 percent; truck volume up 5 percent; vehicle units up nearly 3 percent; breakbulk tonnage up 5.1 percent; and rail volume is off .5 percent. The port continues to introduce new capacity at VIG with three new container stacks coming online in mid-May.